Jacta Alea Est! (The Die Is Cast) - Guten Tag!! Note: Hamlets father was also named Hamlet, so when I mention Hamlet, I mean the son Hamlet, not the father. Note: The letter that Claudius gave to the two friends told the King of England to kill Hamlet. Jacta Alea Est is Latin for "The Die Is Cast." Julius Ceaser said it when he crossed the Rubicon River to attack the Gauls. I was supposed to choose either Hamlet or Romio and Juliet to do for this assignment. So I chose Hamlet. The plot of Shakespeare is a Danish prince named Hamlet, and it starts that his father had just died. Hamlet is in mourning for his dead father for many days. Hamlet's uncle then takes Hamlets rightful place as king by marring Hamlet's mother, and Hamlet thinks that the move was rather suspicious, and so he watches his uncle and mother very closely for the next few scenes. After a scene or two in the play, the ghost of Hamlet's father starts to walk the ramparts at night scaring some guards and other people around the ramparts, and then one night the ghost talked to Hamlet. Hamlet was told by the dead king that Hamlet's uncle, Claudius, had killed him by pouring poison into his ear as he slept, and to please revenge him by killing Claudius in return. Hamlet wants to test the theory before he kills Claudius, and so calls in a group of highly trained actors and he writes the script for them, which, surprise, surprise, is somebody pouring poison into a kings ear and killing him, and then takes the time to pick up the crown and put it on his head. Claudius is horrified by seeing his guilt put on public, and runs where Hamlet throws at him the verse, "What! Scared By False Fire!" Claudius goes to the chapel and prays, and there Hamlet thinks about killing him, but decides not to because he is in a church and would go straight to heaven. After Hamlet finds out that Claudius is guilty, he starts looking for the best time to kill him, but just cannot seem to find the right time. Claudius secretly orders two of Hamlet's friends to take Hamlet to the king of England on "peace terms" and then gives them a letter and tells them not to open it and give it right to the king. Hamlet catches on to the trick, and writes another letter and changes it out with them as they slept. The two friends are then killed because of the letter that they had given to the king of England. 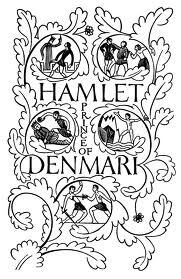 Hamlet then returns to Denmark with some pirates, and tries harder then ever to kill Claudius, now full aware that Claudius is guilty. Eventually Claudius and Laertes, an enemy of Hamlet's, poison a sword and ask Hamlet to sword fight with Laertes. In the end Hamlet and Laertes are dying, and Hamlet kills King Claudius as he died.